This work light package has four LED floodlights mounted on a light bar at the tip end of the outer boom. Wiring is enclosed in steel conduit welded to the cab side of the boom. Lights are controlled by a switch on the control console. These work light packages have eight LED floodlights. 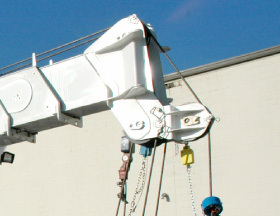 Four are mounted on a light bar at the tip end of the outer boom, wiring is enclosed in steel conduit bolted to the cab side of the boom. Two lights are mounted on the front of the cab, below the windshield. Two more are mounted on the rear of the cab, just below the roof line. 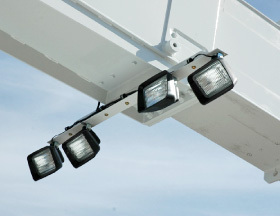 The boom mounted lights are controlled by a rocker switch and the four cab mounted lights are controlled by a second rocker switch. Both switches are on the control panel in the cab. The rooster sheave is a pin-on rigging accessory with a composite sheave identical to the boom tip sheaves. It is required if rigging more than six parts of line, or when an auxiliary winch is used. A second ATB transmitter can easily be bolted to it when used with an auxiliary winch. It is a complete install kit with easily removable pins. This option gives the operator a second winch to operate as a tag line. The second winch is a 12,000 lb single speed unit, mounted directly behind the main winch. A down haul ball is included. Optional rooster sheave, up to 7 parts of line can be rigged. A 15 tube stainless steel heat exchanger is installed in the hydraulic tank. 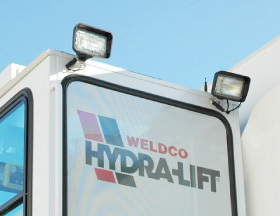 Heat from the truck’s cooling system is used to pre-heat the hydraulic oil during cold weather operation. 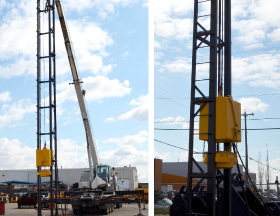 This option is a must have for any crane that will be using its hydraulic system without cool down periods, such as continuous operation of a pile driver or a concrete ladle. The oil cooler is mounted on the curb side of the turret and features twin electric fans which are automatically controlled with a thermostat set to engage at 140° F. The fans can also be manually controlled with a rocker switch, located inside the cab, to operate at temperatures below 140°. Return oil from all the control valves flows through the cooler before returning to the oil reservoir. 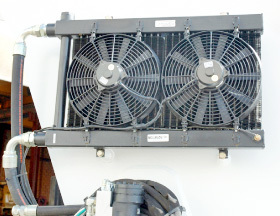 The cooler is equipped with a 60 psi bypass relief valve for internal protection. 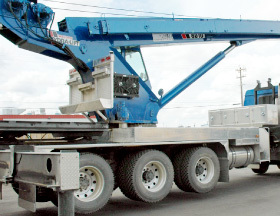 This self leveling work platform adds versatility to a crane by converting it into an elevating platform for accomplishing work that would normally require an aerial device. Installation is simple, requiring only one or two pins.